From the last posting, we were expecting to be feeding tube free. Well, C is a proud new owner of a mic-key button, aka a G Tube. Feeding basically did a 180, and C was losing weight. We made the decision to get a G Tube placed because his nutrition is very important. We worked really hard to continue to feed orally only, but it just wasn’t enough. Feeding time had become very stressful for everyone and we do not want C to associate any stress with oral eating. We had to look at the bigger picture. Do we continue to try oral feeding only and compromise his safety and health? NO WAY! So, we went in to GI for an ad hoc appointment on Oct 22nd. During that appointment we decided it was best to have C admitted to the hospital. In admitting, we could get everything he needed done more quickly. Everything went very quickly. They placed an NG Tube, which goes through his nose into his stomach. We were very clear in communicated to all players, we did not want to go home with an NG Tube. If we were going to be feeding C through a tube, we wanted to go forward with placing a G Tube. The expected wait was 4 to 6 weeks. The Surgery Resident visited us on Wednesday. Thursday they informed us we were possibly going to be put on the schedule for surgery Friday. Then boom, we were put on “The Boards.” The surgery boards are apparently somewhat elusive and hard to get on so quickly. Friday was very difficult, the waiting…… and more waiting. C was finally out of surgery and we could start the feeding process. Saturday morning, Surgery came and cleared us for real food. Later that afternoon we were on our way home. So quickly it all went. So far C has gained over a lb in two weeks. He is doing very well. We have had adjustment of course, but all in all it has been a good decision. C never ceases to amaze us. He takes everything in strides, hardly complains about a thing. He is a happy kid. In other news: C had his first haircut. It was so cute. He didn’t much care for it initially. But once we got out the camera and started snapping pics, he was into it. He loves having his picture taken, then looking at them after. 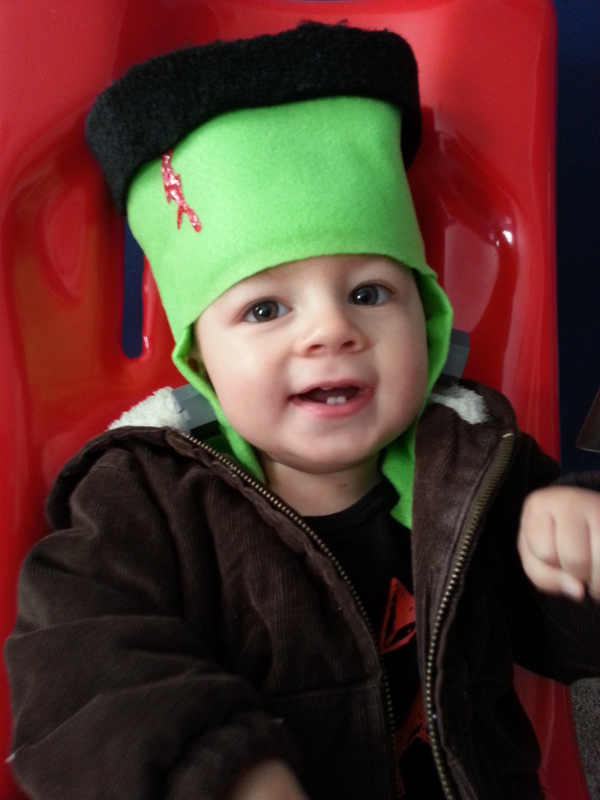 He was Baby Franklinstein for Halloween.